For the first time in India, I question the guidebook. It has been a trusty companion, never leading me astray, except, of course, for the occasional gone-out-of-business hotel. 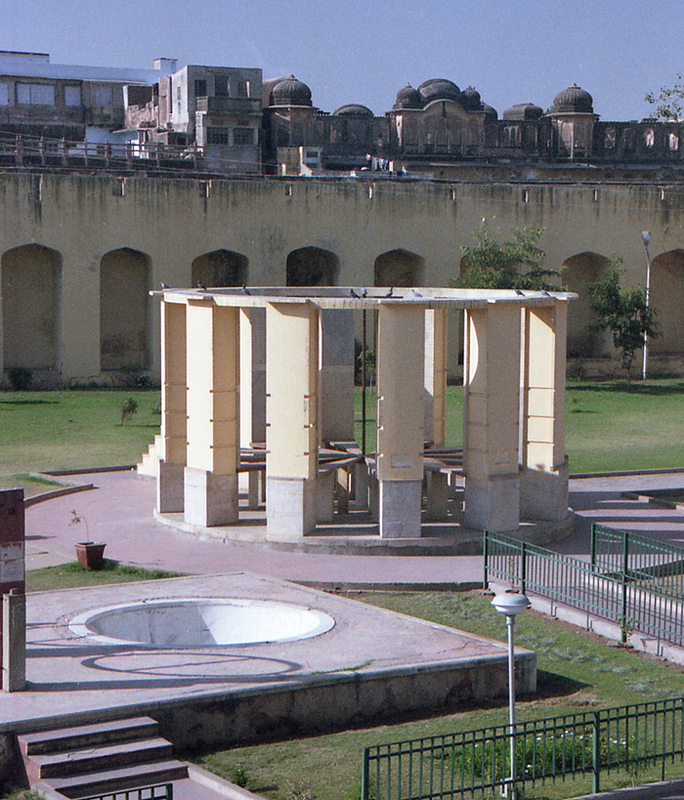 But now it says there is an observatory in the center of Jaipur. Town centers is not the place for an observatory: obscure mountaintops, yes; wide expanses of empty desert, yes; center of light polluted town, no. But if there is a chance of an observatory tour, I’m not going to miss out. While the guidebook had been reliable, the streets of India had not. Street signs were missing, swerving roads built for oxen a thousand years ago twist in strange directions, and sometimes, for no apparent reason, the street names change from block to block like the tide. Today, I was confident I was near the observatory. The map was the right way round in my hand, I was looking at the correct city, the cross-streets actually had signs and they corresponded to the map, but despite all of this evidence, there was no observatory. On one side of the street is a two-story stone building with rolling arches along its length. And on the other side is a pale salmon pink wall. There was no stereotypical dome with telescopic cigar sticking out from its side anywhere to be seen. When in doubt ask, even if you don’t speak the language. There was a break in the salmon wall, so I entered and saw a tiny hut, built for one, with a small money-accepting window, and a man inside. There was also sign welcoming me to the observatory. I guess I don’t need to ask. I gave the man his money, we both smiled, and I received a pamphlet with my change. So I stepped into the observatory, and saw exactly was I wasn’t expecting. Directly ahead was a small green lawn, and in the middle of that stood what looked like Stonehenge, but modernized. That was not all. Over there, on a concrete stand in between more green lawn, were two depressions, perfectly round 10-foot holes in the ground, like a giants shot put indentations. Over there were a couple of golden gongs the size of doorways. And over there, standing proudly over all, was a 10-story triangle, pointing at the sky, with wings and a tiny pagoda on top. My first though was: Who hired Escher to build their child’s playground? My second was: Wow, that’s a hundred foot sundial. And a huge grin spread across my face as I realized that this was the observatory, and all of these bizarre shapes must be ways to view the stars, to understand the cosmos. To better understand the earth and how it works. The little pamphlet said it was built in the 1720’s and 30’s. That’s fifty years before the American Revolution. 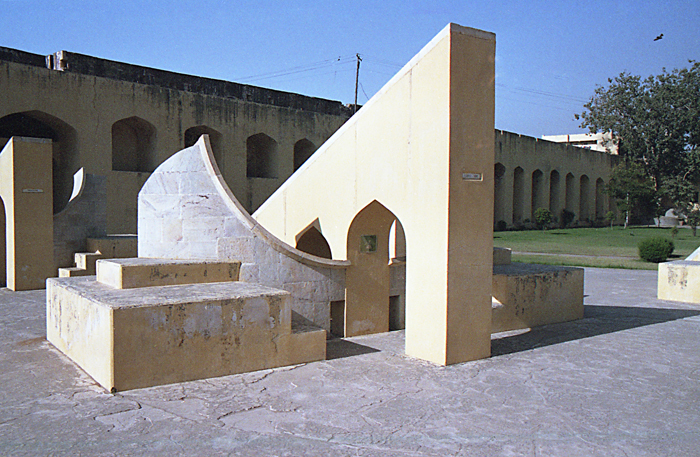 The name of the observatory is Jantar Mantar. Jantar means instrument, and Mantar calculation. So it literally means calculation instrument. 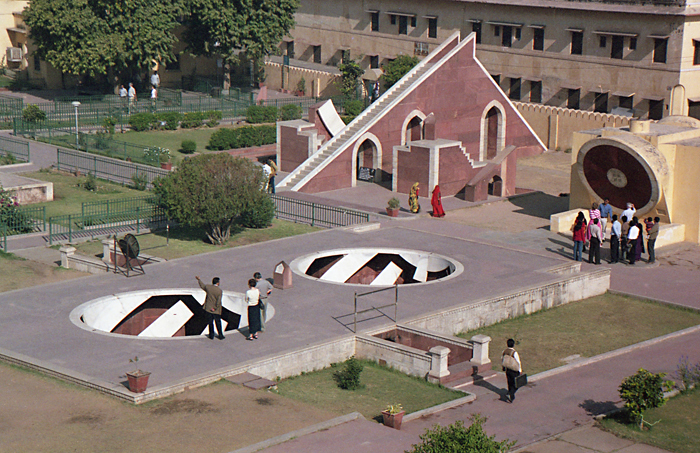 Which does not sound as romantic as Jantar Mantar, but is the perfect descriptor. 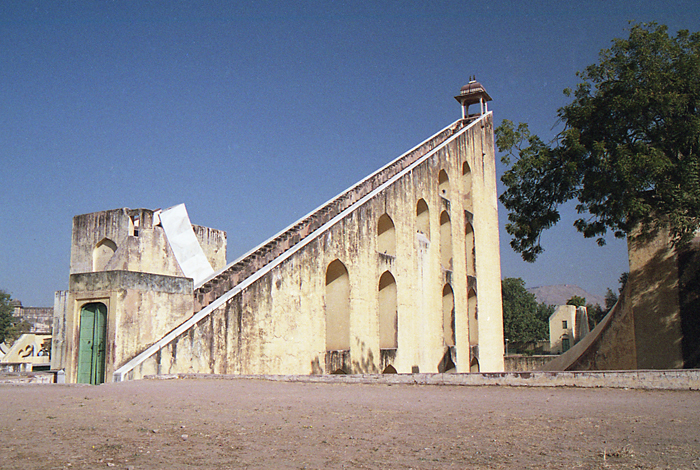 Jantar Mantar was built out of stone by the Maharaja Jai Singh II, who came to the throne in 1700 at the age of 13. 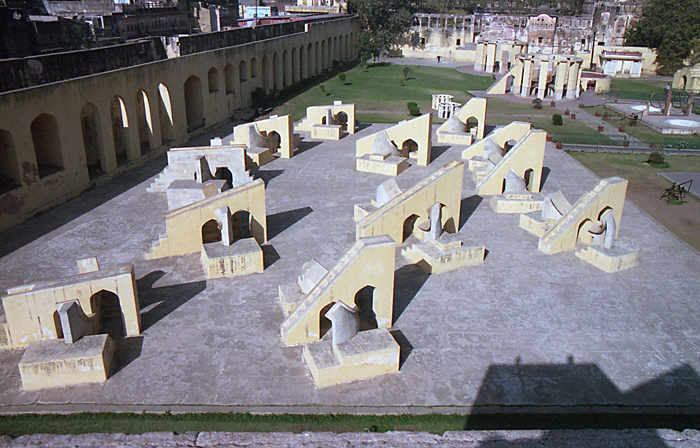 This was not the first of the observatories he built, Delhi was the first, and Jaipur is modeled after that. He built a total of 5, in Delhi, Jaipur, Ujjain, Mathura and Benares. 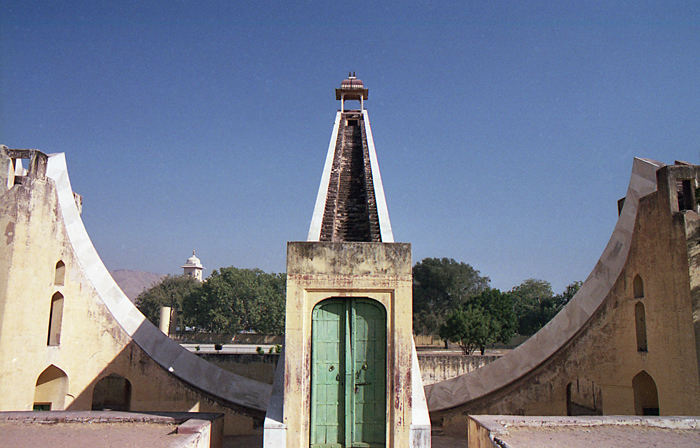 The observatory in Jaipur is the best preserved, probably because Jai Singh built this city from scratch, moved his court here, and made it his capital in 1727. Jai Singh had a lifelong love of astronomy and mathematics. He kept up with current European astronomy by staying in contact with the Portuguese Viceroy in Goa. He published his own astronomical tables, and supplied corrections to the leading French astronomical tables of the day, the ones created by Philippe de la Hire. The first instrument I saw, the modern Stonehenge, is called Ram Yantra. Yantra is another way of writing Jantar, so it means instrument. Ram Yantra is for finding the altitude and azimuth of the sun. Altitude describes how high the sun is in the sky. Where 90 degrees is directly overhead and 45 degrees is exactly half the distance from overhead and the horizon. The horizon is, of course, zero. To find an object in the sky, the observer needs to know how high to look (altitude) and where on the four compass headings to look (Azimuth). Azimuth is measured the same manner as the 360 degree scale of the compass. Zero degrees is north, 90 degrees is east, 270 degrees is west, etc.. So it would be possible to say: altitude 40 degrees, azimuth 250 degrees, and the object would be medium height in the sky and almost due east. Getting back to the Stonehenge piece, the pole in the center is the gnomon (or more simply put, the part that casts the shadow) and the inside walls are the readable scale. The sun, using the pole, casts a shadow on the wall, and the altitude can be read. Around the top of the structure, where the pigeons are unceremoniously sitting, are the 360 degree graduations, which is where the Azimuth is read. I would like to make another note about some of the instruments, including the Ram Yantra above. There are sometimes twin mirror images of the instruments standing side by side. Take for example the photograph below of the Narivalaya Yantra -two half circles in the ground, which calculate the position of the sun. The idea behind Kapeli Yantra is to find the position the stars during the day. This is usually impossible, due to that pesky sun, but this instrument bypasses the invisibility of the daytime stars with an engraved map of the stars on the inside of its bowl. The sun shines through a small metal disk held in place with wires over the maps, and the placement of the stars can be determined. 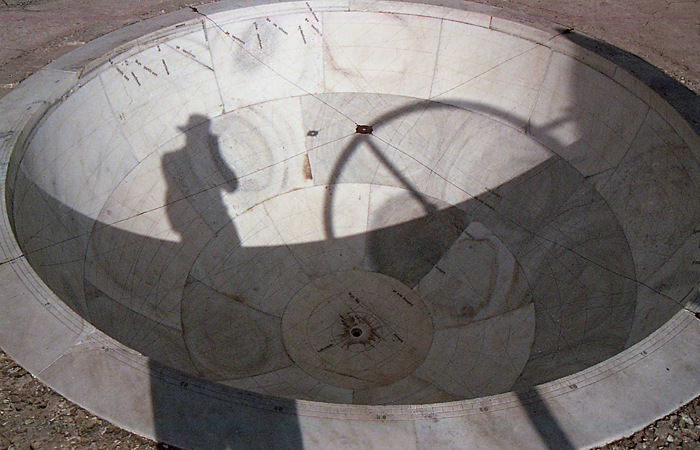 In the photograph below, and observer can see, not only their own shadow, but the metal disk dangling in the center of the bowl and its shadow falling on the map below. As Raj is translated as king, The Yantra Raj is the King of the Instruments, and supposedly Jai Singh’s favorite. It looks like a seven-foot tall gong, with a hole in the center and detailed swirling carvings covering its face. The hole in the center –with the sighting tube added- is to position the Pole Star. 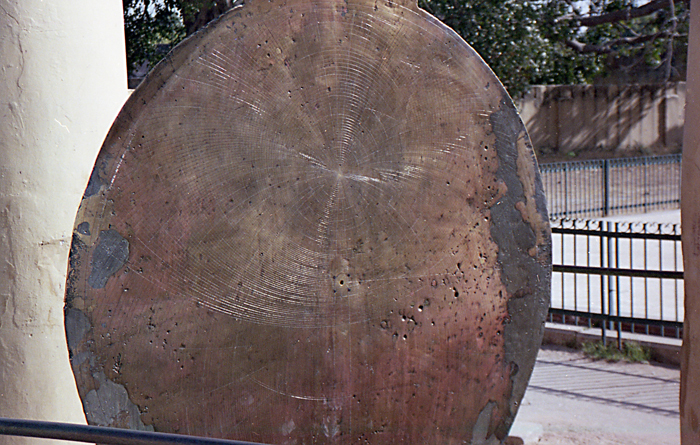 On the disk -which was built from 7 different metals to keep the size constant despite changes in temperature and pressure- are markings for the 24 hours and 360 degrees, as well as altitude circles, constellations, celestial circles and prominent stars. This instrument is used to measure many things. From the altitude of stars and the sun, to the positions of the planets to help predict solar and lunar eclipses. It is also used to find the precise positioning of the Zodical signs for astrology. There are 12 stone instruments standing by themselves on a flat piece of concrete. They each stand about 10 feet tall, and they all look like stone sundials; but sundials that are askew. The angles are wrong, the orientations are slightly off, it’s like someone had 12 miscalibrated levels, and used a different one to build each piece. There is a good reason why the Rashivalaya Yantras are off, it’s because they have nothing to do with the sun, they are to find the 12 Zodiacs. Astrology was, and still is, very important in India. Marriages were -and are- arraigned by the stars. Children’s futures, business, and friendship all dictated by the 12 signs. One of the driving forces in building this observatory was the study of Zodiacal signs. These 12 instruments are calibrated to find the precise position of the planets at the child’s birth, thus to know who your child will marry and if they will be a success. Samrat Yantra is the eye catcher, it’s the one that towers over everything else. There is something about a 27 meter (90 foot) sundial to make your day. Samrat means supreme, so this is the Supreme Instrument. It is built on the simple principal of a sundial, but taken to new heights. There is the huge triangle, with the sloped side at 27 degrees, which is the latitude of Jaipur. 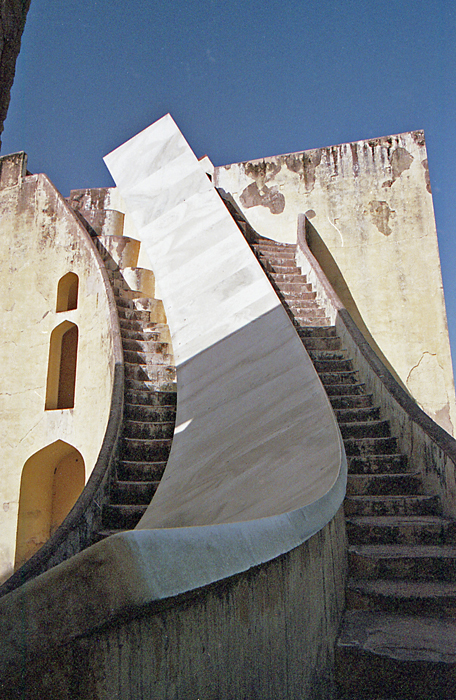 This sloping side has steps, so that the little Hindi Chatri -or pagoda- on top can be used to announce eclipses or the arrival of the monsoons. On each side soar wings, or less romantically, but just as beautifully, the sloping rounded scale to read the time -down to an accuracy of two seconds- one each side of the towering triangle. The triangle is the gnomon (the shadow caster) and casts a shadow on the scale/wings. The shadow on the scale moves the width of a hand (6 cm) every minute. There are steps on either side of the scale, for easy reading, and it’s a pleasant place to sit and watch the sun move. It’s not every day that it’s possible to watch the sun move. Despite the beauty of the instruments, they were out of date almost as they were made. Advances in glass made telescopes the instrument of choice by this date. This group of grand stone instruments could be called the last great hurrah of the classical stargazers. Wandering about this Escher garden, I was in a wonderful mood, but I had not stopped to consider why. I knew part of it was the beauty of the instruments, they soar and are grand and amazing, but it is not just for beauty’s sake. They were also built for a purpose, and that makes them even more beautiful. But there was something more to it than that. It did not come to my mind till I stood next to a young couple admiring the Yantra Raj. They were European, and he had a sharp spark in his eyes and a smile, and she looked bored, like she was being forced to watch grass grow. She looked unimpressed by his argument, and I wandered off, knowing now, why this place was so special to me. It’s the same reason why London’s Greenwich is special, why the VLA in New Mexico is special, why the Large Hadron Collider is special. It’s because they were built to make the pool of human knowledge greater. And hopefully, that makes us better too.